Get ready to go retro for this online slot game! 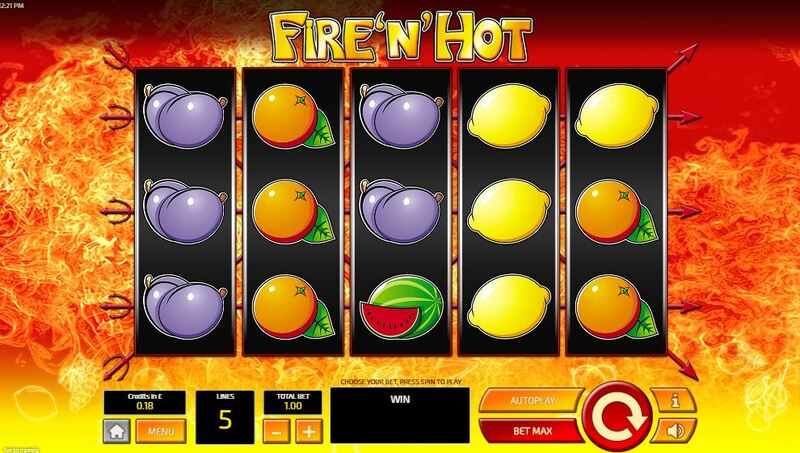 This 5-reel, 5 pay line online slot from Tom Horn combines the old school fruit slot with a hellish theme to create fun and excitement as you play Fire N Hot slot game. This game is red hot with the back ground of explosive, fiery flames glowing red and orange behind the reels. There is a playful reference to hell and the devil himself with the red pitch forks and pointy tails coming out of the reels as indicators for the pay lines. On the reels are all the symbols you would except to see on a classic slot. There are bunches of grapes, lemons, plums, oranges, watermelons, cherries and different 7’s symbols as well as the classic star. Maybe if you can make a deal with the devil while you play this casino slot, you might just be in for the chance to win big. If you can’t wait to get started on Easy and learn more, click here. Firstly, check out the wild feature for this game. This symbol is the wild 7 symbol and it will substitute for all symbols on the reels except for the mystery scatter symbol. 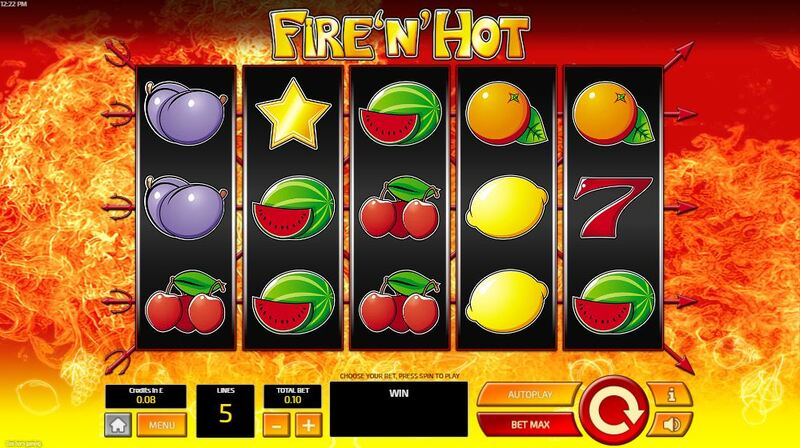 The scatter in this online slot is represented by the star which can appear anywhere on the reels. When three or more of these stars lands on your reels a bonus game will be triggered. When the bonus is triggered, each triggering star will uncover a symbol from the game that they have been hiding. You will choose one star to uncover the symbol at which point all the stars will burst into flames and you will be awarded the win that triggered it. Last but not least there is a gamble feature for this game, giving you the chance to win more!